Leather-wrapped buffalo skull by artist, Linda Hensley is a stunning piece to hang over your fireplace. Each skull is unique. This painstaking process involves boiling the skull to clean and preserve it, wrapping quality leather around the skull in such a way that it conforms completely to the buffalo skull. 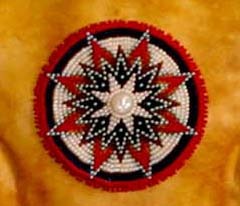 Once this process is complete, Linda, who is also a talented bead artist, creates a unique beaded centerpiece that complements the color of the leather and picks up other colors in your room. Finally, Linda adorns the horns with turkey feathers and strips of leather. The custom beaded centerpiece is $85 extra. This leather-wrapped buffalo skull looks great in southwestern style, rustic, or western style rooms. It is also the perfect piece for a masculine office or study. This is a custom order and takes 4-5 weeks from order to shipment time. Shipment is via UPS ground. We remove the horn caps to make sure they do not break in transit and double box the skull. Typical shipping cost runs from $30-$50 depending upon where you live.